Coffee is a staple in almost every adult’s life. In the U.S., 50% of the population – equivalent to about 150 million Americans! – consume different types of coffee, from espresso, cappuccino, latte to iced versions. And we rarely have just one cup; statistics say that the average consumption among coffee drinkers is 3.1 cups a day. If you’re like us, you probably guzzle the average (or more) amount of coffee per day. But what would you say to coffee that’s got butter in it? Would you drink it? You may have heard about bulletproof coffee recently. It’s one of the latest diet hot items (literally), and while some people may just consider it one of those fads (remember juice fasts? ), many swear by its weight loss benefits. 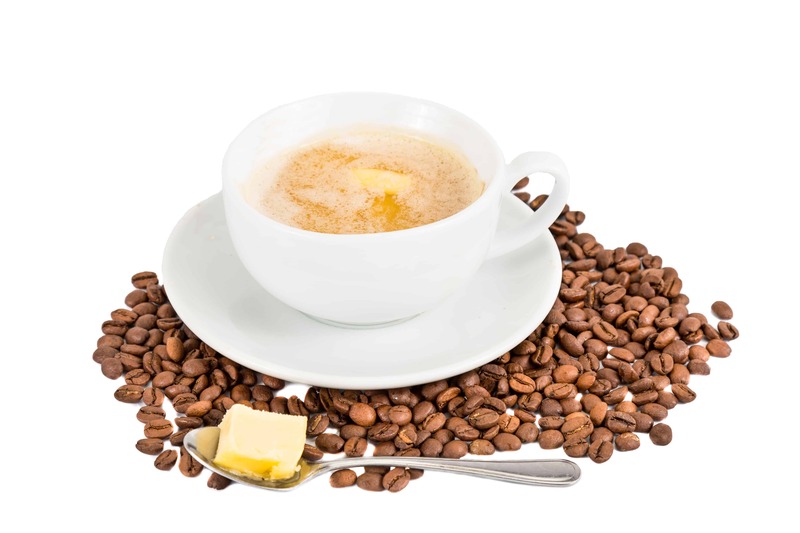 Bulletproof coffee, or butter coffee, is a mix of high-quality coffee beans with powerful fats, such as grass-fed butter or coconut oil (MCT oil). The basic idea behind the unusual formulation is to drive your energy and focus, without the sugar crashes you may experience with just regular coffee. By consuming fats in the morning and restricting sugar and carbohydrates, you essentially achieve optimal functioning without getting hungry and fatigued. What’s more, this coffee can regulate insulin secretion, which makes the body store fat. Now, bulletproof coffee isn’t the same as adding a stick of butter to your instant brew! That’s just gross! You have to use quality ingredients to make this drink. In a bulletproof coffee, the quality of coffee beans counts. Coffee often carries naturally-occurring mold toxins that might be carcinogenic. Upgraded coffee should be used, as it is full of essential nutrients, polyphenols, and antioxidants. Plus, if you drink coffee made of quality beans, you can improve your focus and recall, and even lower your risk of heart conditions. Butter gives bulletproof coffee the fat content and the creamy consistency. In choosing butter, you want grass-fed over regular butter (from grain-fed cows), because the latter has a different fat composition that doesn’t go well with coffee both taste-wise and consistency-wise. Grass-fed butter has more healthy fats and fat-soluble vitamins like vitamin A, K, and E.
For people who are lactose-intolerant, there’s an alternative: grass-fed ghee, which is butter that’s been heated and strained to remove the milk fats and water. This process eliminates lactose and casein, which causes issues for some. According to official Bulletproof resources, Brain Octane is four times as effective as coconut oil in stimulating ketones – fat-burning molecules in the body. Brain Octane is a purified form of saturated fatty acids called medium-chain triglycerides (MCTs) that are sourced from 100% pure coconut oil. There are 4 different types of MCTs: C6, C8, C10, and C12. Most oils sold on the market are a blend of these types, but if you want the most effective ingredient for your bulletproof coffee, try to look for C8 variety, as this is the most ketogenic oil among the choices. Brew 1 cup of coffee using your premium coffee beans. You can use a French Press to make it convenient. Next, add 1-2 tablespoons of Brain Octane oil. If you’ve just started drinking bulletproof coffee, add just 1 tablespoon, and progress to 2 tablespoons after several days. Add 1-2 tablespoons grass-fed butter or grass-fed ghee for lactose-intolerant drinkers. Mix everything in a blender for a few seconds until you get a rich, foamy latte. If you don’t have the time to do this in the morning, you can grab a ready-to-go cold brew from select cafes that offer bulletproof formulation, or purchase a packet of Instamix creamer, which contains grass-fed butter and Brain Octane oil in powder form. You can easily add this to your coffee cup. Additionally, you don’t have to be limited to coffee. You can get the same benefits by blending these special ingredients to other drinks, like tea, matcha, chocolate, and others. Just don’t add any sugar, and you’ll be good to go! Carb-heavy breakfast staples like cereal, toast or granola may give you a quick burst of energy, but after a few hours, your blood sugar will crash, leaving you hungry, tired and distracted. As bulletproof coffee contains grass-fed butter, the saturated fat from this key ingredient gives you steadier levels of energy compared to just simple sugars and carbohydrates. The MCTs help as well. When combined with caffeine from coffee, you get prolonged energy for hours. No crash, and no jitters, too! This type of coffee can encourage fat loss, as it stabilizes “hunger hormones” like ghrelin, keeping you satiated and feeling full for hours. You’ll eat less because you don’t feel the need to. This type of coffee encourages conversion of ketones, a type of molecule that your brain uses more efficiently than sugars. People notice their ability to focus for longer when they add bulletproof coffee to their daily routine. The polyphenols from coffee combined with the MCT oils do wonders for your gastrointestinal tract. For instance, MCT can heal and protect the gut lining, improving your body’s defense against bacteria and toxins. Instead of preparing a full breakfast meal, why not just spend a minute or two to blend your own bulletproof coffee at home. Stash it on a thermos and take it with you to work! Or stop by your local coffee place if they are offering this special brew. Bulletproof coffee is an easy way to gain a steady flow of energy throughout your morning. It heightens the health benefits of regular brewed coffee by incorporating healthy fats to the much-beloved drink. If you want to suppress your hunger pangs, stabilize your hormones, and maintain focus even without a heavy breakfast, this drink is for you.